Discussion in 'PC Gaming & Rigs' started by Razorclam, Dec 17, 2016. Seen a few streaming this and it looked decent enough .. but like any early access game, roll that dice. Very positive reviews though and it is quite cheap at £15.74. Think I paid about that for starbound and that gave me plenty of fun. I've also seen a few streams and videos and I got one am really quite tempted. Subnautica was the other game! New? Where have you been? On some kind of armed forces training? That's been out ages! This game is a complete mess. It's been constantly rebooting my PC and now will just reboot my PC while it is starting up. Completely unplayable and Microsoft support have just told me that is acceptable and not a reason for a refund. Last money I ever spend on the MS Store. As far as I am concerned, even a Game Preview game in this state should not be sold for any money. I bought the game yesterday, had a 20 minute run on it before I went out. never had any issues with it other than a bit of initial lag when the capsule was descending down to the planet surface. I bought it through steam though, so maybe that has something to do with it. it's pre-alpha, so bugs are to be expected. they even mention it in the introductory loading screen. from the limited time I had on it, I think I can see the potential for a great game. Moaning about bugs when you knowingly bought a game in Early Access? PLEASE. To be fair mate, is the game rebooting his hole computer not a bit strong? Not in my book. I'd accept anything can happen with unfinished games. That's why I don't buy them. I'll consider it when it's out of Early Access though. It does look rather pretty but I'm not sure it's my kind of game. It was released in Early Access in December 2014, however is due for full release in Jan 2017. If your game doesn't launch when starting, then you have every right to complain. 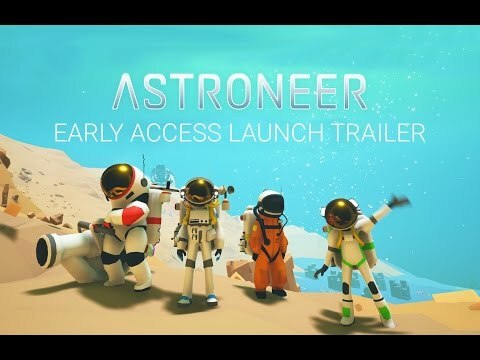 Early Access means that the game may be changed or has in game bugs or never finished, but it should at least run and be stable. That is from Steam though, I believe the person having loading issues bought it from the MS store, not that the above shouldn't apply and be par the course irrespective of where it was purchased from. As an aside though, I bought it (via Steam) and liked it instantly. It did crash when I tried to do something the game obviously didn't like, a report pop-up appeared which I filled in, but it's a wonderfully atmospheric little title and I'm looking forward to playing it in multiplayer. maybe it was just a corrupted installation. how about completely uninstalling it and doing a fresh install? I put in another 20 minutes on it earlier, again with no issues. if I do encounter any problems, I'm ok with it, because I know and understand where it is in it's development stage. Uninstalled and reinstalled and same problem. I understand the whole game preview thing but not even being able to start it and paying £15.74 is a bit much. But if the game not even loading is acceptable to someone else because the game isn't finished yet then fair enough. Perhaps they shouldn't be charging over £15 for it though. The Microsoft Store is dead to me now though. I'll stick to Steam. are you on windows 7 by any chance? Just contact them again and speak to someone else, then ask to speak to their supervisor, if they don't help. Just say that you purchased the app by accident, don't even mention technical difficulties. You can also contact the Dev themselves, they can authorise a refund on the store directly. Also don't buy anything through Windows Store again, if you can help it, stick to STEAM or GOG, where you can easily get a refund, regardless of the games development status. I won't be buying from windows store again even if it is exclusive to it. I've removed payment options from my Microsoft account. Never again. Cause you had one bad experience? Do you do that everywhere you go? Go back on chat and I guarantee you'll get someone willing to refund it. Not all chat reps are the same. Tried again same response. In all honesty, I've got better things to do than waste any more time on Microsoft. With a 7 month old baby my free time is like gold dust so I'm not wasting any more on MS support. I'd rather write it off and stick to steam. It's not like I get a lot of gaming time these days anyway. Well you may as well just wait until a patch makes it playable for you now you can't get the money back. Seems odd as I've heard others having no problem doing so. Sure it's not a unstable over clock pushing it over the edge? Anyway, not the end of the world. You live and learn. Their stance of both occasions was "it doesn't have to work because it is game preview programme". I appreciate it having bugs and problems but not even loading is a bit much. This is the risk with early access. Heck, the steam version might have done the same thing for you which is why I don't buy early access. The way I see it, I wouldn't buy half a sandwich when I was starving. True but the big difference is you are guaranteed a refund on Steam. I don't disagree with you on the early access stuff but I've also had some great games too. Rust is one of my favourite games and has been absolutely brilliant throughout early access. Same with Dayz standalone and that has plenty of bugs (but it's still generally playable ).